In this cleverly unscripted sitcom, everyone’s got a plan for their life . . . that just isn’t working out. There’s Tom, the out-of-work mechanic and hopeless romantic. He’s got everything he needs, but nothing he wants. Roommate Alex was living off his parents’ trust fund until the economy went bust. Now he’s stuck on Tom’s couch and might even have to find a job of his own. Together with friends John and Skip, these guys are always hatching new schemes — trying to get rich, get the girl, or just get by. 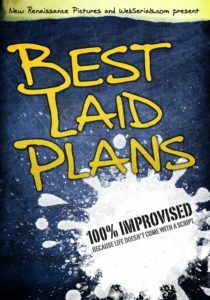 Completely improvised by the cast, Best Laid Plans is a unique and amusing look at the unplanned ups and downs of our everyday lives. Originally produced for Hulu, this comedic web series drew hundreds of thousands of viewers and was one of the site’s most watched independent comedies, at times eclipsing network sit-coms like The Office. The series is now available on DVD or at WebSerials.com.